What’s your biggest dream? It’s a loaded question. A Literacy KC Family Reading Day was held at Woodland Elementary October 13 for about 30 children and adults. Clare Hollander, a librarian from the Kansas City Public Library, led the event. I looked around the classroom; every single student was smiling. It’s moments like this that remind me how important Literacy KC is, and how our classes pay a huge role in our student’s success. As for me? My biggest dream is to help as many people as I can, whether it be to advocate for them, teach them, or even just listen to them and show that I care. That’s the reason I applied to be an AmeriCorps VISTA and became the Family Reading Program Coordinator at Literacy KC. For the past year and a half, the Family Reading Program has had two main components: Adult Education and Family Literacy. Recently, we’ve noticed is that the adult education class we offered was becoming very similar to our adult literacy Ticket to Read classes. As a result, for the first time ever, we are now offering Family Reading Days only. 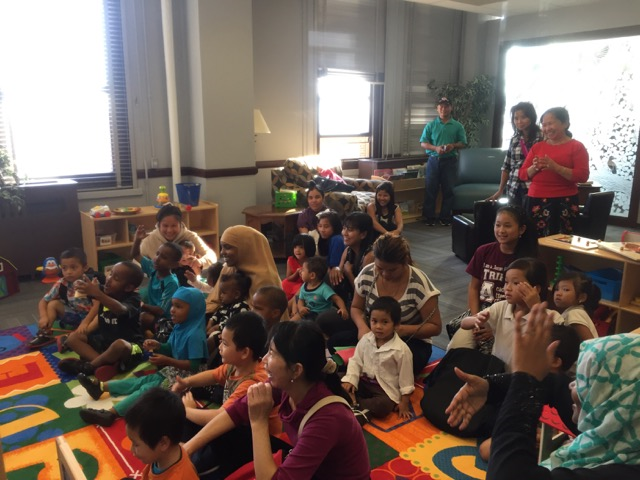 Family Reading Days occur biweekly or monthly (depending on the site) and are an interactive story time for ALL members of the family. A librarian typically reads 3-4 stories, sings songs, leads a literacy related craft or activity, and then every child gets to leave with a brand new book! This kind of parent/child event has been very popular and successful in schools, so we are offering ours outside of the Kansas City Public School district: in community centers, apartment complexes, and transitional housing locations, or shelters. In a 2014 study, the University of North Carolina found that “the size of a home library is the most important influence on a child’s reading performance in 42 nations, followed by the parents’ occupational status, then parents’ education status” (Evans, Kelley, Sikora, 2014). We hope that through the Family Reading Days program, we will be able to give out hundreds of children’s books, as well as give parents the knowledge, resources, and tools to be able to read with their children effectively. I’m very excited about the future of the Family Reading Program, and hope that through our recent change, we can begin to break the cycle of intergenerational illiteracy. When these families are asked, “What is your biggest dream?” it is my hope that they are as inspired as are our Ticket to Read students, and can see that literacy is the most important skill to help them reach their dreams and those of their children.